With income drawdown – also known as 'flexi-access drawdown' – you keep most or all of your pension pot invested and draw an income from it. Unlike an annuity, the income isn't guaranteed for life, so this option carries more risk that your money might run out before you do. However, in return for more risk you do gain more flexibility with income drawdown as you can vary the amount you take according to your need. If you don’t feel confident dealing with all the complex decisions, we recommend you speak to a financial adviser. A financial adviser will help you decide if income drawdown is right for you; what product and provider to choose and what level of income you should take. An adviser will then keep an eye on the funds for you over time and provide further advice if circumstances change. When you first set up your income drawdown scheme you can choose to take up to 25% (a quarter) of your pension pot as a tax-free lump sum. You move the rest into one or more funds that allow you to take a taxable income in amounts and at times to suit you. Most people use drawdown to take a regular income. You are not locked into your income drawdown scheme – you can at any time use all or part of it to buy a more secure retirement income product such as an annuity. If it all sounds too complicated, we strongly suggest you use a financial adviser. See next steps for our Retirement adviser directory. 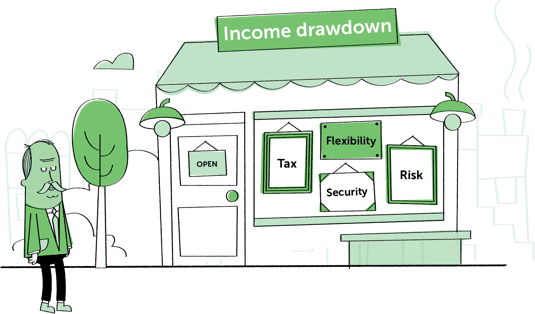 In order to decide whether income drawdown may be suitable, you'll need to take into account your other sources of income in retirement and, in particular, how much of this is secure. Many of us are living longer so you need to ensure you have enough secure income to make ends meet throughout the whole of your retirement. If you have no sources of secure income at all, or just the state pension, you need to think carefully as to whether income drawdown is right for you. See next steps section for our Retirement income options tool for an overview of your other choices. Depending on inflation, the performance of your investments, and any changes to your income needs, you may need to adjust the income you are taking periodically. If you are not sure where to start, a good rule of thumb is to take a maximum of 4 per cent of your pension pot as income in the first year and in subsequent years increase this amount by inflation each year. Research has shown that this approach means your fund has a good chance of lasting throughout life. However, this will still depend on the performance of the funds you are invested in. Go to the income estimator to find out how long your money might last depending on how much income you draw from your pension pot. It's not just your income that's likely to change in retirement, your spending will too. For example, you may no longer have to pay fares to get to work but if you spend more time at home your household bills may increase. If you draw up a budget of how much you're likely to spend when you retire you will have a clearer picture of how much income you will need overall. This in turn will help you work out how much you'd need to take under income drawdown when taking into account your other sources of income. When considering income drawdown, you need to weigh up the risks of an income that isn't secure against the benefits of a potentially higher income and more flexibility than you'd get with an annuity. With income drawdown your income is not guaranteed for life – or from year to year even. If your investments fall in value due to stock market movements, or the income they produce doesn't keep up with inflation you may have to adjust the amounts you take so you don't run out of money later on. You need to plan for this. You will need to think about whether you choose investment funds that invest cautiously in return for a slightly lower income, or riskier funds that offer the potential for a higher income – or a mix of both. It will depend on your appetite for risk. You are not locked in for life with income drawdown. To help provide more certainty, you can at any time use all or part of the funds in your income drawdown to buy an annuity or other type of retirement income product that offers guarantees. This could make sense later in life, for example, when you might get a higher annuity income due to your age. What is available in the market will vary at any given time so you'll need to keep your choices under review. Note that you won't get a second tax-free lump sum when buying an annuity using income drawdown funds. You can also change the level of income you receive – however they may be charges associated with this. You pay tax on your income withdrawals at your appropriate Income Tax rate, taking into account your overall income. If you have other income, for example from earning, rent or investments, you'll need to plan carefully how much drawdown income to take, to avoid pushing yourself into a higher tax bracket. Your drawdown provider will pay the cash and take off tax in advance – called PAYE (Pay As You Earn). This means you may pay too much tax and have to claim the money back – or you may owe more tax if you have other sources of income. You can set up an income drawdown scheme and continue paying into a pension, but the maximum annual pension contributions you can get tax relief on once you start taking income under drawdown is £4,000 (or the amount of your earnings if it's less). This is down from the usual Annual Allowance of up to £40,000. If you want to carry on building up your pension pot, this may influence when you start taking your drawdown income. The tax relief you get for future pension savings is not affected if you take the tax-free lump sum but no income. If you're not earning, you can still get tax relief on contributions up to £3,600. The maximum pension savings you can build up without incurring a tax charge when you draw out your savings (and without leaving a tax charge for your beneficiaries if you die before age 75) is £1,030,000. If your pension pot is worth more than this, you'll pay tax (25% on income and 55% on cash lump sums) when you withdraw the excess amount. If you have a good life expectancy, you'll need to plan carefully how long your money needs to last because under income drawdown it isn't guaranteed for life. A 65 year-old man now has a 50% chance of living to 87 and a 65 year-old woman has a 50% chance of living to 90. Take too much and you could run out of money. Equally, you don't want to live more frugally than you need to because you're worrying too much about running out of money. Use our income estimator below to see how long your income might last. If you have a medical condition or a short life expectancy due to lifestyle or other factors you may be entitled to an enhanced annuity, which could provide you with a higher income than a standard annuity or than is safe to draw in an income drawdown scheme. At the very least you should compare the guaranteed income you might get with an enhanced annuity against the income that drawing 4% of your pension pot might give. The tax rules for passing on your unused drawdown fund are set out below. Be sure to complete an expression of wish form to say who should inherit what’s left when you die. If you don't, your estate may have to pay unnecessary Inheritance Tax. When you die, whoever is dealing with your estate must notify your pension provider of your death. If you die before you're 75, any remaining income drawdown fund passed to your nominated beneficiary within two years is tax free. They can take this either as a lump sum or as income. However, if the money is claimed more than 2 years after your death, any money paid will be added to the beneficiary’s income and taxed at their appropriate rate. If you die aged 75 or over, any lump sum or income paid to your beneficiary is added to the rest of their income for the year and taxed at their appropriate tax rate. If the income your investments produce doesn't keep up with inflation you may have to adjust the amounts you take so you don't run out of money later on. You need to plan for this and making changes. Switching funds to get a better income is another option, but this could be costly. Fees and charges will apply to your fund's management and can eat into your investments. This in turn may affect whether they keep up with inflation and how soon your money runs out. You will also need to keep an eye on the overall performance of your investment funds. If you get poor performance over time then you may need to adjust the income you are taking to avoid running out of money. Income drawdown requires an active investment strategy. This means choosing a mix of investments that will produce an income at the level you need to last throughout your retirement and with enough spread of risk to ride out the peaks and troughs of stock market movements. To achieve the right balance you will normally to need to mix (or 'diversify') your investments across a range of 'assets' such as cash, shares, property funds, corporate bonds and so on. You also need to be ready to react if markets change significantly, and know when's the right time to move your investments into more secure funds as you grow older. The table provides a snapshot of current income drawdown providers, and the products they offer. This is for information only to familiarise you with the types of products on offer and where to buy them. However, choosing the right income drawdown scheme is complex. Different schemes have different charges and some are more flexible than others. For example, in theory, you should be able to alter the amount of income you take or withdraw ad hoc amounts. In practice this may not be as simple as it seems and you are almost certainly going to be charged for it. So when you are choosing a scheme, check the charges and ask how flexible the provider can be. If you are at all unsure we strongly recommend you get help from a regulated financial adviser. Although you will have to pay for the advice, it could save you money in the long run. View Income Drawdown providers and their products. Some of the drawdown providers listed will deal direct with you, but it's unlikely that they will offer you advice in terms of what funds to invest into and how much to draw. Instead you will have to make these decisions yourself. This is fine if you know what you are doing, but if you make a mistake you can't later complain. Also if you go direct to a provider you will normally only be offered the choice of one product. Bear in mind that if you buy without advice the cost of the provider's service will most likely be built in to the product charges, and won't necessarily be any cheaper than getting advice. We suggest you compare the pros and cons of buying direct against buying through a regulated financial adviser. It's important to understand that income drawdown is not something that you set up or get advice on once and then forget about. Your investments need regular monitoring (at least once a year) to ensure the right balance of capital growth and income is being maintained to produce the level of income you need now and in the future. If stock markets fall or specific funds perform poorly corrective action will need to be taken. This may involve switching funds or, in extreme cases, drawdown providers. Also, as your needs change later in life, it may make sense to adjust how your money is invested to provide you with more security. This may include switching to products that offer a guaranteed income, such as annuities. Unless you are a financial expert, managing your income drawdown investments is not something to take on yourself: a financial adviser will offer all of the above as part of their service. If you buy an annuity, that's it – there is no changing your mind or your provider. However, with income drawdown it is possible to switch to a new provider if you need to. However, be warned, this is likely to be costly and therefore not to be done lightly. The actual 'transfer' of your funds could take several weeks which means your money may not be invested during that time. You may also have to cash in some or all of the funds you hold and buy new funds with your new provider (unless direct transfer is available). There may also be exit charges from your existing provider. So, while switching providers is possible, it’s not something to be considered unless you feel you are really paying over the odds on charges or receiving really bad performance. Better to get it right the first time – which is why taking financial advice from a professional who can help you with this complex choice, may save you money in the long run. If you're already taking income from an existing 'capped drawdown' fund (closed for new applicants) and you withdraw more income than is allowed by the drawdown 'cap' then you are considered going forward to be in 'Flexi-access drawdown'. You can't change your mind and go back into capped drawdown once you exceed the cap and the tax relief you can get on future defined contribution savings is reduced – see the later section on Tax to understand more. Flexi-access drawdown is just one way you can use your pension pot – and you can mix it with other options. Use our Retirement income options tool to review your choices. Draw up a budget to help plan what you’ll have when you retire. Take advantage of this free and impartial government service that helps you understand your new pension options. This is especially important with income drawdown. There are a lot of complex choices to make and getting advice from a financial adviser might save you from making expensive mistakes.